NORCAL Group is committed to safeguarding, guiding, and protecting our physicians and healthcare professionals. This extends to supporting the health and well-being of all healthcare team members, because we know that when they’re at their best, they can deliver the best care to their patients. CME credit is available to NORCAL’s policyholders for some of these presentations via MyACCOUNT and the MyNORCAL mobile CME app, along with dozens of other risk management and patient safety activities. Typically each activity is an hour and provides an opportunity for AMA PRA Category 1 Credit™. Research indicates that a majority of physicians may be suffering from burnout and that burnout is nearly twice as prevalent among physicians as among other workers in the United States. Who or what is responsible for physician burnout is a complicated question that has prompted a great deal of research over many years. Burnout in physicians has been defined as emotional exhaustion, impersonal reaction to patients, feelings of incompetence, low achievement, and lack of motivation. There are multiple tools to measure physician burnout and wellness. Assessing the problem is a key organizational and personal strategy for ensuring quality patient care and physician well-being. Despite burnout being a work-related condition, burnout solutions, until fairly recently, have focused on physician self-help. But self-help does not solve the root causes of burnout, which can be attributed to systems and administrative requirements. Consequently, there is a business case to be made for burnout reduction and physician wellness. Burnout can affect every aspect of healthcare delivery. For example, burned-out physicians are more likely to be involved in poor outcomes and have lower patient satisfaction scores, which can have a significant effect on government reimbursement, patient retention and reputation. Burnout can negatively affect workplace culture by diminishing empathy among coworkers, causing disengagement from teamwork and reducing commitment to corporate values. In addition to the costs associated with burnout-related loss of goodwill, decreased reimbursement and patient injury, burnout is associated with high physician turnover costs— it can cost from $500,000 to more than $1 million to replace a physician and onboard a new one. In other words, it costs two to three times a physician’s annual salary to replace that physician. (Turnover costs for nurses experiencing burnout are comparable.) Like many issues associated with healthcare, prevention is cheaper and safer than managing the downstream consequences of full-blown burnout. NORCAL Group's Risk Management Department has identified three broad categories of work-life stressors that can impact the wellness of healthcare professionals. Resources have been created to help physicians, physician leaders and administrators understand and address these sources of stress, with the goal of reducing professional burnout. There’s a real difference, though. Rather than rehashing the causes and effects of these stressors, our intent is to offer information, practical resources and innovative strategies to help healthcare professionals create meaningful change and improvement. Let’s get started. Electronic health records (EHR) — including electronic medical records (EMR), electronic prescribing, electronic patient portals, and computerized physician order entry (CPOE) — are a main cause of physician burnout. There are strategies for reducing EHR-associated burnout, including: improving EHR usability, using scribes, delegating data collection duties and improving EHR expertise. Physician distress associated with being involved in an unanticipated patient outcome (also known as “second victim syndrome”) can last for months or even years. Second victim syndrome can exacerbate or trigger physician burnout. 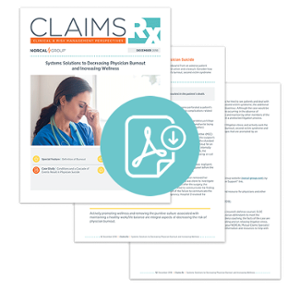 Physicians and administrators can use various strategies to avoid and manage second victim syndrome.